Renowned for its deep river gorges, and cascading waterfalls, we decided to take a day trip to the nearby city of Tivoli. This alleged half-hour jaunt took us all day to get there. Why you may ask? Well…it’s complicated. Let’s just say that despite our incredible cost savings by staying in an apartment (advantage! ), there’s something to be said for having a front desk staff and concierge to answer questions and book excursions (disadvantage!). Chris didn’t want to wait. So he went over to a machine and managed to purchase tickets for four to Tivoli for a mere $9.20 Euros instead of the $48 Euros the cab driver had told us it would probably cost. Hmmm…curious. It took us another half hour of wandering around the station attempting to communicate in halting/broken Italian/English to figure out the tickets he’d purchased were actually leaving from a different train station. So we hustled back outside and hailed another cab to take us to the new train station, Tiburtina. Once there, we eventually discovered where we needed to be and boarded the train with several other people. It took off, only to come to a complete stop a few minutes later. We sat there for several seconds. Some people got on. Some people got off. Then the train started again. 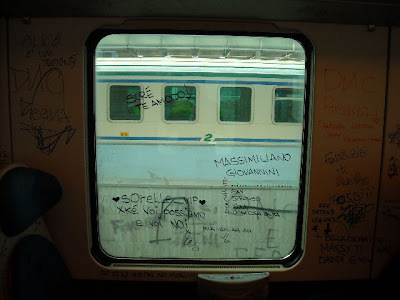 This happened several times and we realized that although it was called a “train” it was actually more like an above-ground subway (perhaps the rampant graffiti should have tipped us off), stopping at different cities along the way to our destination. “How will we know when to get off?” Ashleigh asked anxiously, while Chris dozed contentedly beside me. Everybody we had boarded the train with in Rome got up and waited expectantly for the doors to open. “This must be it!” I said, and we all hopped off the train. It jetted off down the track, while we stood blinking in the bright sunlight, getting accustomed to our surroundings. As we’d experienced several times since coming to Rome, there just weren’t any people around for question-answering. I walked into the station, which was actually a small room with a couple of ticket machines and no people, of course. I found a map of the train route and figured out that—surprise, surprise—we were actually NOT in Tivoli. Nope. It appeared that Tivoli was another three stops and several miles up the track. Studying the train schedule, we figured out that another train would pass through the station in approximately 40 minutes. 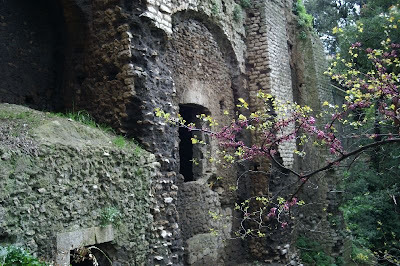 “I guess Bagna di Tivoli doesn’t get a lot of tourist traffic,” I commented, nodding politely to wide-eyed passersby. Suddenly, we noticed a bus drive past with “Tivoli” lit up across its front banner. Several moments later another one came by. We spotted a newspaper stand up ahead and Chris asked the clerk if she knew where we might get a bus ticket to Tivoli. And guess what? For $1 Euro each, we got tickets! Eventually, a third bus came up the road, and we clambered on board. The bus took off. However, just like the train, it stopped periodically to let people on and off. Ashleigh shot me a look. Once again, I wondered how we’d know when we were in Tivoli. As we peered out the windows, I noticed we were climbing higher and higher up a steep, winding road. 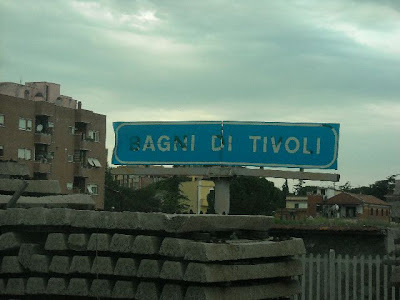 I recalled that Tivoli was described as a hilltop city. So once we hit the town at the top, I suggested we get off the bus. We disembarked and finally—3-1/2 hours, two taxis, one train and a bus ride later—we found ourselves in the center square of the hilly town of Tivoli. 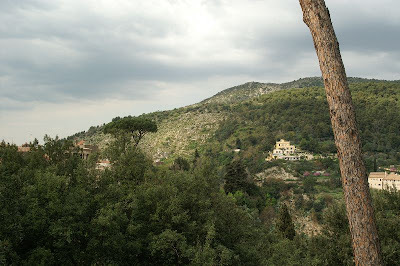 We chose to start with Villa Gregoriana Park, and hiked uphill about a mile or so to get there. 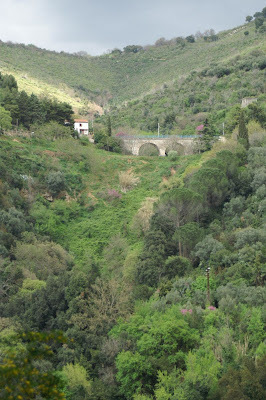 The park is named for Pope Gregory XVI, who saved Tivoli from river damage by diverting the river through a tunnel, weakening its flow, and creating the Grande Cascade waterfall. The park was very lush and green. 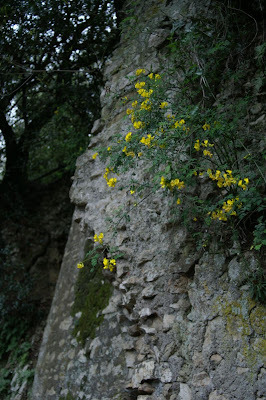 It had a raw, natural beauty that was in complete contrast to big-city Rome. 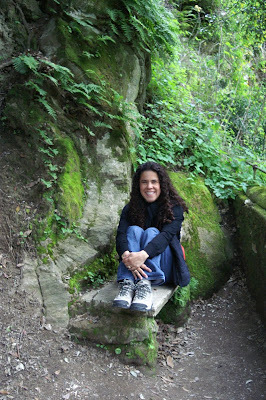 I didn’t realize how much I was missing fresh air, flowers and just being in nature until be started hiking around the Villa Gregoriana. 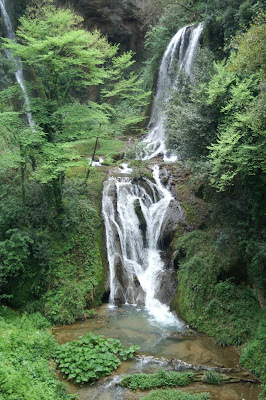 As promised, it was full of beautiful gorges, refreshing waterfalls, and ancient castle remains. 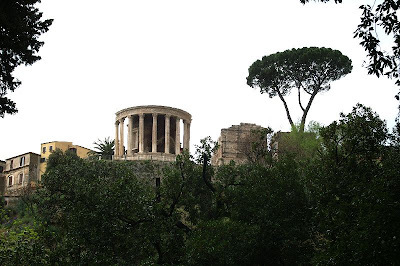 Here is a ruin of an ancient Temple of Vesta from the Villa’s trail. Holly didn’t want to wait. I figured it might be best if we used our remaining time to figure out where the train station was, and when the last train left Tivoli since it was Good Friday. From the park’s ticket counter, we were directed to hike further up the steep hill where we found the train station. Another one-room deal offering no actual humans, only machines. My hubby once again purchased tickets. 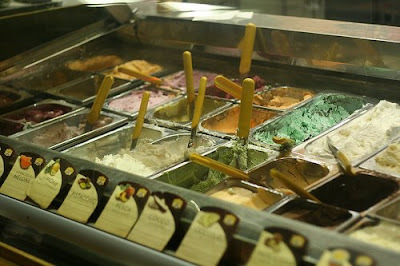 This time the cost for all four of us was $24.50 Euros to get back to Rome. Hmmm…curious. And we finally made it back to the apartment around 7:30 p.m.
We all flopped down, ready to call it a night. Or so I thought. But Chris was still up for adventure. 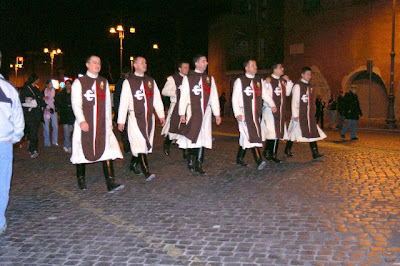 “Let’s head downtown to see the Pope lead the 9:00 p.m. Good Friday procession to the Colosseum,” he suggested. The minute the word “dark” was out of my mouth, BAM! All the power in the apartment building went out. We all sat very still. Blinking in the now total darkness. “Well kids, we may as well put our shoes back on and go. It’s better than sitting here bored in the dark. We headed downtown; the streets were flooded with people. 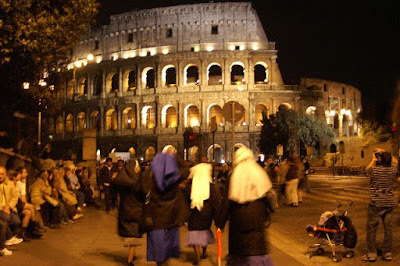 Like salmon swimming upstream, everybody was flowing towards the Colosseum, hoping for a glimpse of the Pope. After talking with a police officer, we discovered that unfortunately, we wouldn’t be able to see any of the procession from the street, but we saw lots of interesting people. 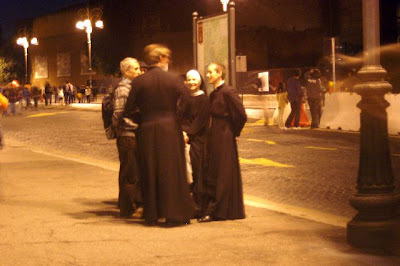 More priest and nun sightings. We got back late and tumbled into bed. The power was back on. Yeah! 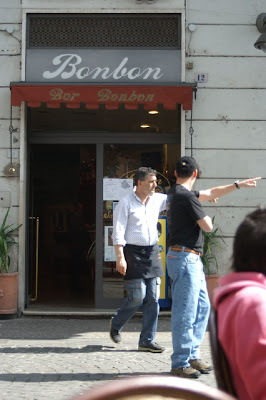 Stay tuned for one more post, Adventures in Rome: The Final Episode. Oh dear, that was a fairly eventful day out, wasn't it!!!? Still, you've got to chalk it up to experience I guess :) At least you made it there and back in one piece and got to see some things on the way! Hi there! I'm a freelance writer specializing in parenting, travel, health and wellness topics, as well as marketing & copywriting for businesses. My work has appeared in regional, national and online publications. Stop by my main site at www.hollybowne.com to see the writing services I provide and samples of my work. Have a great day!